FROST DAMAGE TO YOUR CROP CAN OCCUR IN AS LITTLE AS 20-30 MINUTES. The Chinook blade is 216" long and has usable airfoil of 200". 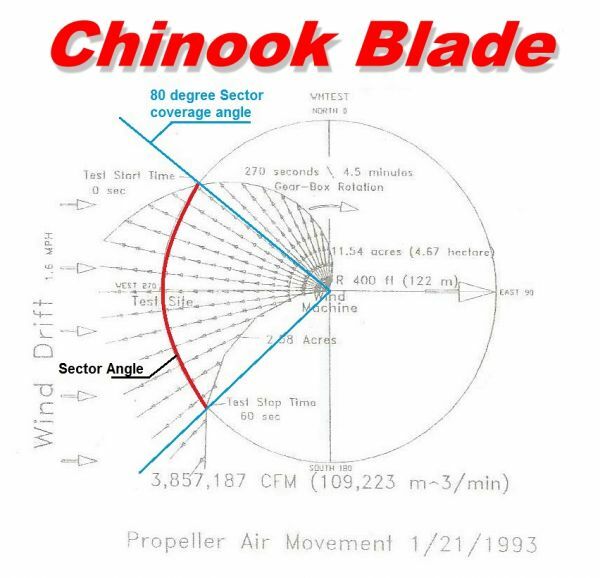 Unlike other wind machine blades, the Chinook is using 92.59% of its available surface area to produce air movement! This is significant! Especially when your livelihood can be drastically effected in just one night. This fixed wedge design functions much like the flaps of an airplane used on take-off and landing, increasing its amount of lift or pressure. Unlike other blades, this means that the Chinook isn’t’ just using its mid section to outer tips to pull the air, it uses 92.59% all of its specially formed,100 lb swinging weight, unibody surface area. It is moving air from the outside of its pivot hub to its Donier Swept tips! These tips actually help reduce drag, maintenance, wear caused by vibration and fuel consumption. The aerodynamics of the Chinook blade is different from other blades. While other fan props move air with sector angle coverage of 45-60 degrees, the Chinook prop widens the sector angle circle of coverage to 80 degrees. In Aeronautics this is sometimes referred to as, the ”flow field”. NASA, multiple universities, independent consulting companies, and working farmers the world over have proven the Chinook blade to be one of the longest last, most cost effective pieces of frost protective equipment. “wedge” design is integrated into each Chinook blade. Chinook fans move larger volumes of air with more immediate temperature rise! Drawing warmer air from the upper atmosphere with increased sector angle helps to raise the temperature on the orchard floor more quickly than with other prop styles. In one documented test, the Chinook fan blade mixed & moved 3,857,187 CFM of air compared with 1,733,362 CFM of air from another competitive fan blade. This is over 2 times more volume of mixed air with the Chinook fan. Why should I choose the Chinook Fan Prop? Chinook fans are not only, competitively priced. They have a 100% satisfaction guarantee. 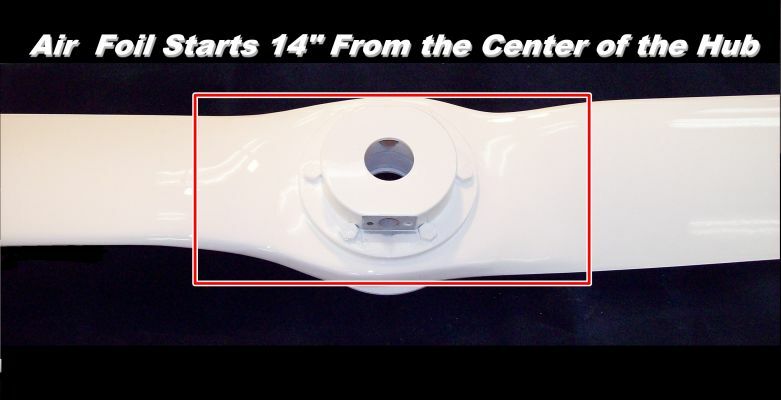 Buy one of our blades and use it for one year, if it does not improve the scope and reach of your towers frost protection we will not only refund your money, we will put your old blade back on free!